The Living with Fire in California’s Coast Ranges Symposium was held from May 7-9, 2018 at Sonoma State University (SSU), in Rohnert Park, CA, as a partnership between the California Fire Science Consortium, Pepperwood, SSU, CAL FIRE, the Sonoma County Forest Conservation Working Group and local public and private agencies. 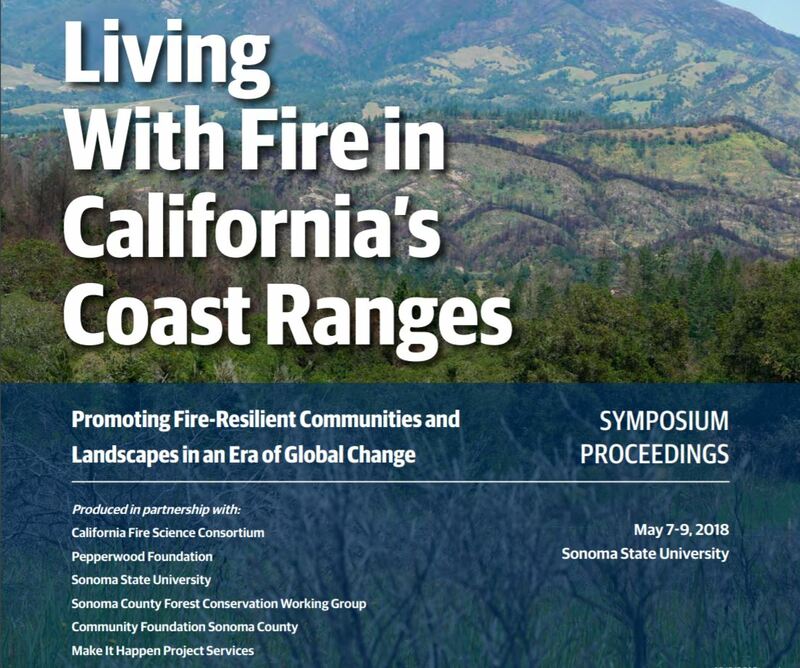 Organized in response to the devastating October 2017 North Bay wildfires, the symposium brought together more than 400 participants, including members of the general public, scientific community, private sector, natural resource and fire safety agencies, and non-profit organizations. The goals of the symposium included the following. To foster a public dialogue about the ecology of fire in the California Central Coast Ranges and its relationship to humans, ecosystems, and natural resources. To discuss patterns and trends in wildfire over time and the factors influencing those trends. And to explore what agencies, communities, and citizens can do moving forward to enhance community resilience to fire. On this webpage you'll find a compilation of resources from the symposium, including proceedings, video, and presentations. With special thanks to Community Foundation Sonoma County for supporting the production of the proceedings. Click your topic of interest below to jump to available content, or scroll down to view content from all presentations. Summary: Provost Vollendorf welcomed participants to Sonoma State University (SSU) and acknowledged how hard the entire community had been hit hard by recent fires. She invited participants to use the symposium as an opportunity for thinking, leading, and partnering among diverse members of the community. She expressed SSU’s commitment to helping the region thoughtfully rebuild in a way that will better prepare us for future natural disasters. Safford and Quinn-Davidson welcomed participants to the event, provided some background on the California Fire Science Consortium, and outlined the program committee's goals for the agenda. They reminded listeners that wildfire is a natural process and there are many opportunities to make our infrastructure more fire-adapted to improve community resilience. They discussed logistics and facilities issues and thanked the multiple volunteers who made the event possible. Abstract: Fire is an implicit part of California—foundational to its ecological and human heritage. Even in coastal northern California, the landscapes we know and love are mostly adapted to fire, and in many cases, they are dependent on it. This presentation covers basic concepts in fire science and ecology, including the fire triangle, the fire behavior triangle, and fire regimes, as well as local examples of fire-adapted and fire-dependent ecosystems. The presentation also lays a foundation for the talks and field tours that follow, and helps participants see and understand California’s diverse landscapes through the lens of the fire regimes by which they were shaped. Abstract: The vegetation of the north and central coast is diverse and includes coastal scrub and prairie, chaparral, coastal pine and cypress forests, redwood forests, Douglas-fir-tanoak forests, Oregon white oak woodlands, coast live oak woodlands, mixed evergreen forests, and annual grasslands. Fire regimes in these vegetation types vary from frequent, low intensity (grassland, prairie, oak woodlands, redwood), to mixed severity (coast scrub, Douglas-fir-tanoak forests, mixed evergreen forests), and finally vegetation types adapted to infrequent, high severity fire (chaparral, coastal pine and cypress forests). Lightning ignitions are rare in this area of California with Native American’s the most important ignition source in the pre-historic period. Abstract: An overview of fires from the last 100 years in the California Coast Ranges focusing on the central coast area from Monterey to Sonoma. This fire history portrays trends that will likely continue into future years. Abstract: Chief Bertelli relates his experience as a First Responder and Command Officer in the Central Coast area of California where he has worked for 26 years. Fire behavior over the last several years has increased significantly. Fires have moved quicker and farther into populated areas. Utilizing our experience, tools, and tactics to serve and safeguard the people and protect and resources and property of California, the challenges of managing wildland fires for both  natural resource protection  and public safety are increasing. Abstract: California’s Coast Ranges are associated with two key meteorological phenomena: nocturnal drying events and offshore winds, known as Diablo winds. Nocturnal drying in the higher elevations along California’s central coast is a unique phenomenon that affects fire behavior in higher elevations of the region. Single digit relative humidity is not uncommon during summer nights. A low-elevation source region of dry air is located over the northeastern Pacific. This extremely dry air forms above the marine inversion and is transported inland overnight with the marine layer through gaps in the coastal mountains. An average of 15-20 nocturnal drying events per year occur in elevations greater than 700 m in the San Francisco Bay Area and their characteristics are highly variable, making them a challenge to forecast. Diablo winds are offshore, downslope winds that flow northeasterly over Northern California’s Coast Ranges, often creating extreme fire danger for the San Francisco Bay Area. Diablo winds affect the region west of the Sacramento Valley, with a northernmost border in Lake and Mendocino counties and a southernmost border in Santa Clara county. The mean annual frequency of Diablo events is 9.6 and 15.8 for the East and North Bay, respectively. These winds are caused by mesoscale pressure anomalies that are produced when high pressure builds over the Great Basin, similar to Santa Ana winds of Southern California. This presentation showed high-resolution numerical simulations of the atmospheric dynamics associated with the Tubb’s Fire. Simulations indicate that the downslope winds created a period of very strong surface winds to occur during the event, but these low-level winds eventually decoupled from the surface creating a region of calm atmospheric conditions downwind of the Coffey Park neighborhood resulting in reduced rate of spread of the fire. Finally, this presentation highlighted how wildfires can modify the atmospheric conditions in their vicinity, creating their own weather. Data obtained from Doppler lidar deployed during a number of wildfires in coastal California highlight how plumes interact with the marine inversion and can accelerate surface winds surrounding the fire front. Abstract: North and south, 2017 was a phenomenal year for fires in California and demonstrates we are a long way from thoroughly understanding wildland fire. Complicating the picture is the extraordinarily large latitudinal gradient in the state, along with diverse ecosystems and very different fire regimes. In interior mountain ranges seasonal climates are strongly correlated with annual variations in area burned, but on coastal landscapes from Sonoma County to San Diego, spring and summer temperatures are not closely tied to fire activity. In these regions powerful offshore winds are a major determinant of fire size but are dependent on the juxtaposition of wind events and human ignitions. On these landscapes fire prevention is likely to effect the greatest change in fire losses and thus understanding historical patterns of ignition sources could provide guidance on future prevention actions. Throughout the state, fire frequency has increased steadily since the early 1900s until a peak around 1980, followed by a marked drop to the present. Most human-caused ignition sources have declined markedly in recent decades with one notable exception, powerline ignitions. Powerlines have been reported ignition sources since 1905 but as human infrastructure expanded into wildland landscapes the probability of powerline ignitions has risen. These typically occur during high wind events and are capable of rapid spread over long distances. One important avenue for future fire hazard reduction will be consideration of solutions to reduce this source of dangerous fires. Abstract: Tribes utilized fire as a landscape management tool throughout North America in highly complex, thoughtful, and systematic ways for millennia prior to Euro-American colonization. Fuels management was just one of the motivations for applying fire to the landscape under indigenous systems of management, and by focusing only on that function, modern managers may not be benefitting from the full breadth of its possible applications. Significant new research has been developed in recent years indicating these fire traditions were likely far more widespread and influential in shaping the development of terrestrial plant and animal communities in California than previously understood by the dominant culture. Colonial systems almost universally suppressed these traditions, and acknowledgement of the effectiveness of those management practices has been slow – perhaps slower in the US than in other countries. Major disasters of the kind experienced in 2017 remind us of how much work remains exploring alternative cultural relationships with fire, how our modern scientific and regulatory frameworks can both challenge and incentivize this work, and how repairing relationship with tribes may help facilitate new approaches to stewardship of fire-resilient watersheds. Abstract: Smoke contains fine particles measured in micrometers, PM2.5 and PM10. The smaller particles tend to cause the most health hazards, as they can get deep inside lungs and the bloodstream. Smoke is unhealthy, irritating your eyes, respiratory system, and can be especially dangerous for those with chronic heart disease and other conditions. Monitoring includes measures such as Air Quality Index (AQI) of conditions at 24-hour resolution (midnight to midnight). Fires generally do not create even conditions across 24-hour periods. More common are intermittent spikes in smoke for shorter periods of time. New monitoring products include NowCast, which is a 3-hour average measurement, and guides activity levels rather than reporting how unhealthy the air is. This enables individuals to gauge their outdoor activity, recognize their own sensitivities. Abstract: The processes and interactions of a healthy, functioning ecosystem provide a suite of natural assets, or ecosystem services, that are critical to human health and society. These services include the provision of food and water, climate regulation, erosion control, biodiversity, recreation, and cultural values. However, the ability of natural landscapes to deliver these services is threatened by a variety of global change factors including climate change, land conversion, invasion of non-native plants, and altered fire regimes. These threaten the condition of natural ecosystems and lead to the altered provision of services for which substitutes are costly or unavailable. In this talk we describe the effects of wildfire on the provision of ecosystem services and present a case study from the shrub dominated ecosystems of southern California. The incineration and removal of shrubland increases water runoff and sediment erosion (with often drastic consequences for downstream communities) and decreases carbon storage immediately postfire. The increase in fire frequency since Euro-American settlement, particularly in the last few decades, affects the recovery of native shrubs and results in type-conversion to invasive annual grasses. Understanding the consequences of these changes on the provision of services is fundamental to developing effective means of adapting to changing fire regimes and estimating the financial and ecological impacts of wildfire which can be used for fire damage assessments. Summary: We have received very positive feedback on yesterday's program, and today will build on that foundation. Yesterday we talked about the issues and fire ecology in a historical context, and today we will talk about what we can do about it now and in the future. 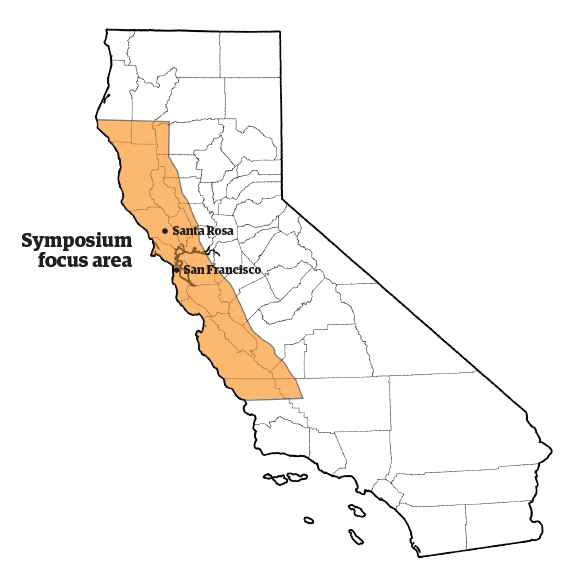 Abstract: Coastal California’s diverse vegetation is adapted to a wide range of climates, from redwoods in the coastal fog belt to chaparral on hot, interior hillsides. During periods of climate change, the distribution of different vegetation types can shift dramatically. For example, at Clear Lake, the fossil pollen record records a change from conifer forests to oak woodlands in the surrounding forests in response to warming at the end of the last ice age. The magnitude of climate change in this century could eventually lead to similar changes, and projections suggest that the conditions favoring hot and dry vegetation types, such as chaparral, will spread across the region. However, little is known about how fast such changes can occur. Several ecological processes limit the rate of change in plant communities and their distributions across the landscape. The roles of disturbance, demography and dispersal will be addressed in this talk, as well as a range of conservation strategies that will be increasingly important as plant communities adapt to changing conditions. Summary: Westerling emphasized that different ecosystems in California display different responses to fire. Montane habitats may be more sensitive to changing temperature because of the influence of snow, since depending on the timing of snow melt, vastly different summer conditions can occur. Statewide wildfire simulations indicate that in the future fire will be more frequent in many areas, especially northern coastal areas and the Sierra Nevada/Cascades. Probabilistic models suggest potential increases in north coastal California of about 50-100% by 2070, and up to 300% by end of century. Bay area increases are estimated at about 50% by 2070 in much of the region, with a hot spot in San Mateo County, projected to increase up to 100-200% by end of century. Examples of extreme fire scenarios indicate that several large fires concurrent in a particular region or across the state could overwhelm firefighting resources and that may be a more common scenario in the future. Abstract: Since the middle of the 20th century, a trend of rapid population growth has led to widespread expansion of housing development, especially in the form of sprawling suburbs throughout coastal California. As development has moved farther into wildland vegetation, the number of structures destroyed by wildfire has also been increasing, culminating in the worst losses in state history in 2017. To better understand why, whether, and how these trends could continue into the future, the first part of the talk explores research on past housing loss to wildfire across California and the US. Results show that, across all regions studied, housing pattern and location have been the most significant factors explaining structure loss to wildfire, relative to vegetation and topography. Despite substantial geographical variability, one consistent finding is that the highest probability of structure loss, as well as the vast majority of structures historically destroyed, has occurred when housing density was low, clusters of development were small, and homes were close to the edge of developments. In some cases, however, once a fire reaches a development, the relationship can reverse, with high-density development facilitating fire spread across buildings, like what happened in the Coffey Park neighborhood. This type of fire spread in high-density development has been infrequent, however, when compared across the 10 most destructive wildfires in state history. The second part of the talk presents results from a modeling study in which we projected future patterns of large wildfire activity and structure loss under different climate change and housing growth scenarios. Model results from the coastal region north of San Francisco suggest that future potential for structure loss will be sensitive both to climatic effects on fire activity as well as the pattern of new development. Future housing growth concentrated in high-density urban areas could prevent a substantial increase in structure loss to wildfire. In conclusion, houses are destroyed by wildfire for many reasons, including fire weather, topography, structure and property characteristics, and often, just random shifts in weather and fire behavior. Nevertheless, a review of past events and a projection into the future suggest that the one of the most influential ways to prevent future destruction is to carefully consider the location and arrangement of new housing development. Summary: Valachovic opened with the observation that there is no silver-bullet that solves all wildfire defense problems: effective hazard reduction will take implementation of a variety of approaches. In the 2017 fires, homes were the most combustible part of the landscape (frequently trees in the yard survived the fire, but the home burned). These patterns can be explained by understanding mechanisms of ember ignition in high-wind fire environments. Embers come in two forms, vegetation vs. construction material fragments. Ember control technologies are low cost, evidence-based practices that can reduce risks of home ignition. Fuel arrangement and availability are two additional factors that can be manipulated to reduce fire hazards. Defensible space includes the following zones, defined by distance from the home: 1= first five feet, 2= five to thirty feet, 3= thirty to one hundred feet. Exposure of homes to fire includes ember exposure, direct flame contact, and radiant heat. Zone 1 should be non-combustible (reduced flame contact), zone 2 should be landscaped with green and live vegetation (reduces radiant heat exposure), and zone 3 should be treated to reduce fuels (which in turn reduces ember exposure). Fire-resistant plants are nonexistent. It matters how landscaping elements are maintained and positioned. All plants can burn depending on conditions, and mulch can burn as well. Home design priorities start with the roof. Venting is important, but vents, gaps and other openings must be blocked to prevent ember retention. Leaf litter clearing is important to reduce ignition points (dormers can be a weak point). Eighth-inch or smaller mesh coverings are recommended. Think carefully about choices of vent components: consider new and better options now reaching the market. Siding should include a vertical non-combustible section. Locations of ignition points such as firewood storage, leaf accumulation, other combustible items should not be stored near the house, especially not under decks. The condition of your close neighbors’ houses is also critical. Abstract: Without regular maintenance, both ornamental and native vegetation around buildings in or next to wildland areas allow fire and or embers to readily transmit a wildland fire into the building. There are measures homeowners can take to break the link in the chain allowing fire into their home. Abstract: This presentation examines some of the challenges, and tools available to achieve widespread acceptance of defensible space standards and home hardening recommendations in Sonoma County’s WUI. Regulation, community education and incentives for voluntary compliance can be utilized to achieve the critical goal of preventing home loss. Working in conjunction with fire agencies and other local stakeholders, Fire Safe Councils can be a powerful grassroots force to help achieve critical goals. Abstract: Data, models, and maps represent quantitative assessment of fire risk, and can serve as effective means of communicating risk and developing mitigation strategies that include regulations, land-use planning considerations, operational support (reduced ignitions and fire spread from fuel treatments; improved suppression response) and individual human behaviors. While well-intended, the messaging and response to increasing WUI losses implicate the maps as insufficient in redressing a well-recognized and reasonably well-understood natural phenomenon. A variety of issues related to science, uncertainty, governance and human behavior will be discussed in an attempt to clarify what risk mapping can provide, and what new approaches may be necessary to both better plan for the future, as well as better understanding of the limits of risk reduction strategies at our disposal. Abstract: As exurban development expands into fire-prone areas, more people face wildfire risks every year. When wildfires occur, emergency managers issue recommended protective actions to the public to minimize casualties. Evacuation is the most common action, but in cases where there is not enough time to evacuate, seeking shelter in its many forms may be more effective. Although public wildfire warnings have a high success rate in terms of life protection, there are still cases where problems occur. These can range from wildfire detection to clearing the last few residents out of a low-egress canyon. Dr. Cova reviews research on wildfire warning and evacuation systems from detection to return-entry, as well as presents work in this area at the Center for Natural & Technological Hazards at the University of Utah. With fire ecologists predicting more fire and planners predicting more growth in fire-prone areas, emergency managers and residents will have to step-up their preparedness activities to new levels to achieve resilient, safe communities. Abstract: Fuel treatments, such as prescribed fire, mastication, and thinning, are commonly implemented by land managers to modify wildfire behavior and effects. These treatments reduce stand density, increase crown base height, reduce crown bulk density, and remove surface fuels to promote desired fire behavior. The application of these treatments will depend on existing fuel conditions, vegetation types, and other factors. In each area, the specific approach taken will require an evaluation of the efficacy of these treatments that consider the management objectives for the site and ecological impacts of treatments. In some instances (e.g. wildland urban interface) trade-offs among objectives and impacts may be warranted. While we have a sound understanding of how to treat vegetation in fire-prone ecosystems, implementing these treatments at a pace and scale sufficient to affect change at the landscape level remains a challenge. Thus, we will need to prioritize areas for treatment such as high value resources (communities, rare species, etc.) and areas at greater fire risk. Ideally, we would also implement treatments in a way that allows greater use of managed wildfire to promote landscape effectiveness. This effort will surely require a unified front among stakeholders to facilitate the coexistence of humans and wildfire in the California Coast Ranges. Abstract: Learning to live with wildland fire, or any natural hazard, is rarely a straightforward endeavor. Wildfire is particularly complex because, in many ecosystems, it is not simply a hazard but a necessary ecological process and inherent part of the landscape. While a great deal of attention has been paid to understanding the biophysical science underlying how to effectively manage fire on the landscape, much less attention has been paid to an equally important part of the living with fire equation: what science can tell us about what shapes how humans, both within and outside fire management, make decisions about how to best live with fire in their landscape. This presentation will address this latter human behavior item. The good news is that there is no need to start from scratch; much has been learned in recent decades about social dynamics around natural hazard mitigation, and in recent years about wildfire mitigation specifically. The bad news is that this information is often overlooked in favor of standard narratives about the problem and potential solutions that are often inaccurate. This presentation will provide a brief idea of the range of ways where better use of existing social science knowledge could improve adapting to having fire on our landscape in a way that both promotes the ecological benefits of fire while minimizing potential negative social impacts. Abstract: Building the resilience of our local communities in a fire-adapted ecosystem will require the formation of strong and diverse partnerships that integrate the strengths of public and private entities capable of bridging traditional boundaries between disciplines, counties, and cultures. This session will highlight case studies of dynamic partnerships weaving together science and traditional knowledge to meet the challenge of advancing vegetation management from a landscape-level perspective. This session will briefly highlight efforts in Sonoma County to create a unified approach across public and private land ownerships, and then provide an in-depth look at successful a partnership in the Klamath River basin focused on collectively creating a better fire future. A key success of the Klamath case study is effectively shifting the public's perception of managed wildfire, prescribed burning, and necessary manual and mechanical treatments to create the social conditions needed to safely apply "good fire" at the landscape scale.